You can find them in the front row during public beheadings and crucifixions held in Raqqa and in all the cities under the control of ISIS. They are used for blood transfusions when fighters of the Islamic State are injured. They are paid to spy and are trained to become suicide bombers without hesitation. 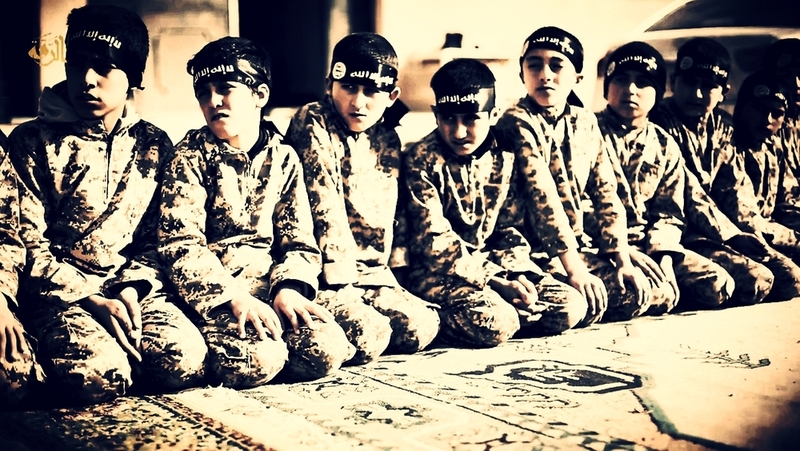 Are the children of the caliphate, the future soldiers of ISIS's envisaged caliphate? Mohammad is a spy, a teenager of 14 years used by jihadists to "listen to" the chatter in the markets and streets of Mosul reporting to his bosses when someone breaks the rules. In exchange for his collaboration and loyalty he benefits financially for each "tip". Omar is one of the many young people who helped to maintain ISIS's intelligence network in the vast territory under the control of the group between Iraq and Syria since 2013. In contrast there is Omar, whose refusal to enlist in the ranks of Abu Bakr al-Baghdadi resulted in the removal of his hand and foot designed as a clear warning to all other teenagers who thought differently from the militia group. The grisly message and reminder to them those aged sixteen and over are expected to serve the Caliphate as spies, fighters and suicide bombers. ISIS continues to indoctrinate and train thousands of children and adolescents in the territories under its control and invests huge sums to the military training and ideological induction of children with the aim of shaping the next generation of jihadist assault troops . According to rumors across the Arab media, the children of the Caliphate would be trained to become spies in their homes and family-life, gathering information on relatives and parents who do not support Baghdadi's cell. This dehumanising process results in the removal of individual, personal feelings which are sighted as weaknesses should they take precedence or oppose the general objective of the creation of the Caliphate. The testimonies of children collected by the international media indicate an estimated (and disturbing) change for the future of the Middle East: thousands, if not tens of thousands, of teenagers have been drafted and sent to fight under a sub-state ideology of messianic and megalomaniacal inspiration with a clear and well-defined political and military strategy. Nor is it simply a male prerogative. Even young girls are a very important cog in ISIS's war machine. Testimonies revealed relate to how the children are being indoctrinated from primary school to seek death as their religious duty. The stories which are picked reveal an organised and structured military training process that aims to cultivate an army of loyal warriors and ideologically pure generation of supporters for the future of the Caliphate. Fred Abrahams, special adviser at Human Rights Watch, interviewed several members of Iraq's Yezidi community who escaped capture by ISIS. According to reports, many have reported seeing militiamen separate the boys from their families to send them in schools for indoctrination and military training. Vice News produced a report from Raqqa, the capital of ISIS. This documentary on life inside the city dominated by the group was chilling as the second of the special episode focused predominantly the feverish way with which ISIS manipulated and trained children through public performances and repeated sermons with obsessive perseverance. One man declared during the reportage: "We believe that this generation of children is one of the Caliphate. God willing, this generation will fight the infidels and apostates, the Americans and their allies." To monitor the whole "system", a network of former military and intelligence officers keep a close eye on civilians, collaborators and dissidents. Many of these officers operated with Saddam Hussein's fearsome Da'irat al Mukhabarat al Amah, the internal services of the former dictator and his Ba'athist party.The officers of Saddam have been and continue to be a potent part of the strength of ISIS structure and operations and played a crucial role in the victories of the group in 2014. Iraqi Finance Minister Hoshyar Zebari, a Kurd who spent years opposing Saddam, recently revealed that former Ba'athists who work with ISIS have equipped the militia with the know-how of all respect, especially with regard to collecting intelligence. "They know who is who, by clans, name by name." Everything else is history. Saddam's former intelligence's management of ISIS's internal affairs have created a sub-state apparatus which regards the indoctrination of children as its lifeblood and long-term guarantor of war against the West, takfiri Arab regimes and leaders, and Shiites. The convergence of the interests between jihadists and members of the former Ba'athist party has catalysed the absorption of thousands of these military cadres. This has significantly strengthened ISIS and its inner circle's strategy, honed its battle tactics and the strengthened the process of nation-building in Siraq. They have become an indispensable part in the self-proclaimed caliphate's survival .